The World's Most Valuable Fine Art Pictures. In general, most of the world's best art resides in famous churches, museums, or galleries. This certainly applies to works by Old Masters like Michelangelo, Raphael, Leonardo, Rembrandt and Vermeer, few of which are in private hands, and most of which are priceless. 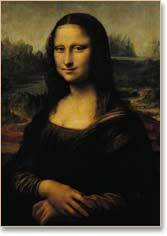 Estimates of the value of the Mona Lisa, vary from $700 million to $1 billion.  Painted by Pablo Picasso (1881-1973).  Sold at auction in 2015, for $179 million.  Seller: Unknown. Buyer: Unknown. The final picture in a series of 15 paintings, all named after Delacroix's masterpiece Femmes d'Alger dans leur appartement (1834), Picasso's Les Femmes d'Alger (version O) was bought originally (along with its 14 siblings) by Victor and Sally Ganz for a total of $212,500 in June 1956. In 1997 it was sold as an individual item at Christie's for $31.9 million. An example of late Cubism, the painting was begun by Picasso in 1954, not long after the death of Henri Matisse, whom he greatly admired.  Painted by Amedeo Modigliani (1884-1920).  Sold at auction in 2015, for $170.4 million.  Seller: Laura Mattioli Rossi. Buyer: Mr Liu. One of Modigliani's famous female nudes, this masterpiece of expressionism shows a naked woman lying on a sumptuous red couch. Painted in Paris during the final year of World War I, it provoked a public scandal when it was first exhibited. An angry crowd gathered outside the Berthe Weill Gallery forcing the police to shut down the exhibition. A bidding contest between seven interested parties, eventually ended just below the price paid for Picasso's "Les femmes d'Alger" (1955). This work and its auction price establishes Modigliani as the most coveted and collectible artist of the expressionist movement - indeed, like Picasso, only rarity has prevented his works from establishing even higher records.  Painted by Francis Bacon (1909-92).  Sold at auction in 2013, for $142.4 million. See also: Most Expensive Irish Paintings. One of the first works painted during the era of "contemporary art", this life-size triptych shows Bacon's friend - the portraitist Lucian Freud (1922-2011) - seated on a wooden chair against an orange background. The remarkable power of the three canvases comes from the juxtaposition of light, airy sunshine with the brutal physicality of both the content and the brushstrokes used to create it. The record-breaking price (under the circumstances, remarkably close to its pre-sale estimate of $135 million) was the result of a bidding contest between seven interested buyers. A combination of expressionism and surrealism, this complex work establishes Bacon as one of the greatest modern artists of the mid-20th century.  Painted by Edvard Munch (1863-1944).  Sold at auction in 2012, for $119.9 million.  Seller: Petter Olsen. Buyer: unknown. 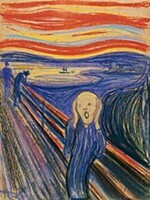 One of the greatest expressionist paintings ever, this Munch masterpiece holds a number of records. The most expensive painting ever sold at auction, it is also the highest priced work of modern art as well as the costliest of all pastel drawings. The work is seen as an expression of personal suffering. Munch's mother passed away when he was 5; his sister Sophie died when he was 14; his father died when Munch was 25, followed by his sister Laura who developed schizophrenia and was incarcerated in an asylum in Ekeberg. From Ekeberg Hill, the location depicted in the artwork, passers-by could hear screams from the asylum as well as the animals from a slaughterhouse nearby. It was also a scene of suicides. There are three other versions of this picture: the Munch Museum in Oslo owns two of them - a pastel as well as an oil - while the National Gallery of Norway holds the earliest version, an oil painting, dated 1893.  Sold at auction in 2010, for $106.5 million.  Seller: Estate of US philanthropist Frances Brody. Buyer: unknown. Known as the "lost Picasso" because it had not appeared in public for almost 60 years this masterpiece - the world's most expensive work of abstract art ever sold at auction - last changed hands in 1951 for $18,000. To illustrate the huge commissions earned by top auction houses, the sale of this work netted Christie's a cool $13 million. The sale means that Picasso - with 3 out of the top 10 - is now firmly established as the most valuable of all twentieth century painters.  Painted by Andy Warhol (1928-87).  Sold at auction in 2013, for $105.4 million. A classic example of Andy Warhol's Pop Art, this 8-foot by 13-foot painting - the last in a series of four pictures depicting car crashes - consists of two panels: on the left, a set of fifteen images of a car accident, including the image of a body sprawled across the vehicle's mangled interior, and on the right, a large silvery rectangle. Estimated to sell for in excess of $60 million, this figure was in fact the opening bid, and after a three-way bidding contest the work smashed the previous auction record for Pop Art by Warhol - now established as the most valuable of all postmodernist artists - by more than $30 million. (Green Car Crash, 1963; sold in 2007 at Christie's New York for $71.7 million.) The painting has been seen only once in public since 1987.  Sold at auction in 2004, for $104.2 million.  Seller: Greentree foundation (Whitney family). Buyer: unknown. The most expensive work of figure painting, this Picasso masterpiece took a mere 7 minutes of bidding to reach the hammered price, which far exceeded the previous record of $82.5 million set by Van Gogh's Portrait of Dr Gachet in 1990, breaking the $100 million barrier in the process. Painted by the 24-year old Pablo Picasso during his more cheerful Rose Period, (following his mournful Blue Period), it is surely his most lyrical example of representational art, as well as one of the most iconic works of the early 20th century and the finest still in private hands. For an explanation of modern works like this, see: Analysis of Modern Paintings (1800-2000).  Painted by Roy Lichtenstein (1923-1997).  Sold at auction in 2015, for $95.4 million.  Seller: Peter Brant. Buyer: Unknown. Instantly recognizable as a Lichtenstein comic-strip style painting, whose colours and tones are built up with primary-coloured Ben-Day dots painted through stencils, this picture of a shocked-looking blonde woman in a stiff white collar and starched white hat was taken from a comic romance novel of the early 1960s. The work - like its sister paintings "Whaam!" (1963, Tate Gallery, London) and "Drowning Girl" (1963, Museum of Modern Art, New York) - exemplifies Lichtenstein's method of making art out of low-brow subjects, which was a defining feature of Pop-art in the 1960s and postmodernist art of the 70s and later. The sale establishes the artist as the most collectible Pop artist after Andy Warhol.  Sold at auction in 2006, for $95.2 million.  Seller: Gidwitz family. Buyer: unknown. Dora Maar with Cat is a large, luminous, portrait of Picasso's mistress, seated on a chair with a small cat perched on her shoulders. Executed in the idiom of Cubism, the artist is trying to present several simultaneous views of Maar's face. When the work went on sale in 2006, it far exceeded its $50 million estimate, and became the second most expensive painting sold by an auctioneer in the history of art. An inspiration as well as a mistress, Dora Maar (1907-1997) was one of Picasso's favourite models and the subject of countless interpretations (eg. Weeping Woman 1937, Tate) during the course of their dynamic relationship which endured for 11 years from 1935 to 1946. 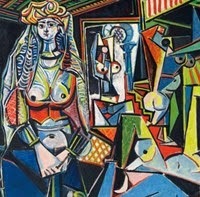 In this portrait of Maar, Picasso has added numerous deliberate narrative or symbolic elements, including: a hat, symbolizing a crown; a cat, alluding to feminine guile and sensual activity; long sharp fingernails (not visible in the picture) to reinforce the idea of feline aggression; a vibrant colour scheme picking out various details of Maar's dress (not visible). Whether these elements were intended to compliment or demonize Maar remains unclear.  Painted by Gustav Klimt (1862-1918).  Sold at auction in 2006, for $87.9 million.  Seller: Maria Altmann. Buyer: unknown. In this second portrait of Adele Bloch-Bauer, which was painted five years after his first version, the earlier gold backdrop has been replaced by a quieter, more detached background. Even so, the halo-like hat and the focus on Adele's face points to Klimt's continuing regard for her. The painting also demonstrates the artist'snew attitude to colour (shorn of its use of gold), as well as his technique of combining elements of reality and unreality. Art critics typically swoon over this latter attribute. One has stated that in this composition: Klimt "demonstrated the liberation of visualization by effortlessly assimilating a whole series of influences and reworking them into a peculiarly inspired personal vision." Quite so. 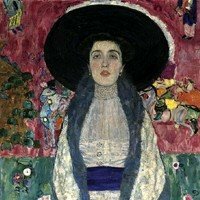 Personally, I think Klimt creates beautifully decorative art, with a few echoes of German Expressionism without justifying the artistic genius suggested by the record price of this canvas. However, he remains the driving force behind the historically important Vienna Secession, and can claim to be one of the best portrait artists of pre-war Europe.  Painted by Paul Cezanne (1839-1906).  Sold privately in 2011, for $250 million.  Seller: George Embiricos. Buyer: Royal Family of Qatar. One of several versions of the same picture - there are others in the Musee d'Orsay, Paris, and the Courtauld Institute Galleries, London - the painting is one of the most sought-after works still in private hands.  Painted by Jackson Pollock (1912-56).  Sold privately in 2006, for $140 million.  Seller: David Geffen. Buyer David Martinez.  See also: Jackson Pollock's paintings (1940-56). If unconfirmed reports are correct, Mexican financier David Martinez paid $140 million for this signature work by Jackson Pollock, making it the world's most expensive painting ever. Demonstrates the growing appetite for concrete art, but other factors may be involved: notably the relative rarity of Pollock's works, his unique drip/ splash style of 'action painting', and his American nationality. The 4' x 8' composition, comprising oil, enamel and aluminum paint on fiberboard, is a nest-like tangle of browns, yellows and greys. It exemplifies Pollock's all-over approach to fine art painting, which treats all areas of the canvas equally, rejecting all conventional points of reference or focus.  Painted by Willem de Kooning (1904-97).  Sold privately in 2006, for $137 million. One of the great exponents of the New York School of gestural painting, Dutch-born Willem de Kooning was noted for his biomorphic synthesis of figurative and abstract styles, often using the female form. Woman III is one of a series of six numbered 'Woman' paintings and the only one still in a private collection. The work's exploration of Freudian themes is visible in its staring eyes, huge breasts and distorted torso, as well as its aggressive brushwork and absence of 'human' colour.  Sold privately in 2006, for $135 million.  Seller: Maria Altmann. Buyer: Ronald Lauder. This work changed hands when a court order by the Austrian government returned it to the Artist's rightful heir after its wartime confiscation by the Nazis. Despite its inflated price-tag, it remains one of the artist's great masterpieces and exemplifies his fascination with the flat decorative features of Egyptian art, the gold and mosaic elements of Byzantine works, Freudian and other symbolism. A romantic workaholic, Klimt's contribution to the Vienna Sezession and Germanic Jugendstil art movement included numerous portraits of Viennas leading ladies, of which this portrait of Adele Bloch-Bauer - the wife of Jewish entrepreneur Ferdinand Bloch-Bauer - is considered a leading example. Klimt completed a second portrait of Adele Bloch-Bauer in 1912 (see No 5 in the Top 10 Auction Records, above).  Screenprint by Andy Warhol (1928-87).  Sold by private sale 2009, for $100 million.  Seller: Annibale Berlingieri. Buyer: unknown. Eight Elvises by Andy Warhol was sold by private treaty in 2009 to an anonymous buyer for $100 million, according to a report in the London Economist. The 12-ft high picture has not been seen in public since it was shown in Los Angeles in 1963.  Painted by Jasper Johns (b.1930).  Sold privately in 2006, for $80 million.  Seller: David Geffen: Buyer: Kenneth C. Griffin. A founding father of Pop-Art, Johns is noted for his innovative use of mixed-media such as oils, waxed-based encaustic painting, plaster and collage (including flags, maps, stenciled words, numbers, newspapers and other 'found materials' or objets trouves). In this work, the most expensive painting by a living artist, Johns uses stenciled words on a brightly colored background which provide a literal allusion to the title False Start. This is because the words - which express colours, red, white and so on - are painted in (and are positioned on) contradictory colours to those described. The use of words exemplifies Johns' utilization of everyday images to stimulate the spectator. See also: Robert Rauschenberg (1925-2008).  Sold privately in 2006, via Richard Gray Gallery, for $63.5 million.  Seller: David Geffen. Buyer: Steven A. Cohen. Another fantastically high-priced work of non-objective art by the Dutch/ American Expressionist de Kooning. Executed in oils, enamel, and charcoal on canvas, it is considered by critics to be one of his most complex landscapes. It was purchased from the artist Sidney Janis and eventually found its way to auction in 1973 where it attracted a record bid of $180,000 from the European dealer Ernst Beyeler. Given its present reported price of $63.5 million, it has appreciated in value 352 times, over 35 years. Not bad for a painting which (I suspect) few people would claim to understand, far less appreciate. I certainly don't.  Painted by Vincent Van Gogh (1853-1890).  Sold privately in 1993, for $57 million.  Seller: Son of Emil Georg Buhrle. Buyer: Walter H. Annenberg. Purchased mid-recession by the philanthropist Walter Annenberg, this outstanding landscape painting now hangs in New York's Metropolitan Museum of Art. It is one of three versions of the same scene, completed by Van Gogh while resident at the Saint-Remy-de-Provence mental institution, near Arles. A slightly later version, also painted in oils, resides in the National Gallery London, and a reed-pen drawing of the same view is in the Van Gogh Museum Amsterdam. The artist himself considered A Wheatfield With Cypresses to be one of his best summer landscapes, perhaps due to his improved mood which is evident from the sunny colours, non-aggressive brushwork and overall warmth of the work.  Sold privately, via Larry Gagosian, in May 2007, for $80.0 million.  Seller: Stefan Edlis. Buyer: Steven A. Cohen. See: Pop Art Portraits. Another huge price for a celebrity portrait by the High Priest of Pop Art, negotiated near the top of the market.  Painted by Titian (Tiziano Vecellio) (1487-76).  Sold privately, via Herve Aaron, in November 2003, for £50.0 ($70.6m).  Seller: AXA Insurance Co. Buyer: J Paul Getty Museum, Los Angeles. A figure of $70 million was allegedly paid in 2003-4 for this outstanding piece of portrait art by Titian, the greatest figure in Venetian Painting. 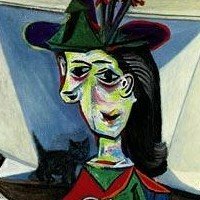 When auction prices are compared by adjusting for inflation (2015), Picasso's Les Femmes d'Alger emerges as the world's most valuable painting.  Sold at auction in 2015, for $170 million.  Sold at auction in 1990, for $82.5 million.  Sold at auction in 2013, for $142 million.  Sold at auction in 1990, for $78.1 million.  Sold at auction in 1987, for $53.9 million.  For more about the world's most valuable paintings, see: Encyclopedia of Visual Arts.